Music star Kenny Chesney was born in Knoxville, TN, but there are no baseball teams in Knoxville or in all of Tennessee. He actually claims to be a Boston Red Sox fan, but his Celebrity Jersey Card shows him wearing a Baltimore Orioles jersey. Is the #7 for Mark Belanger? He does earn points for the hat and glove, but I still want to know why I can't find him repping his Red Sox. 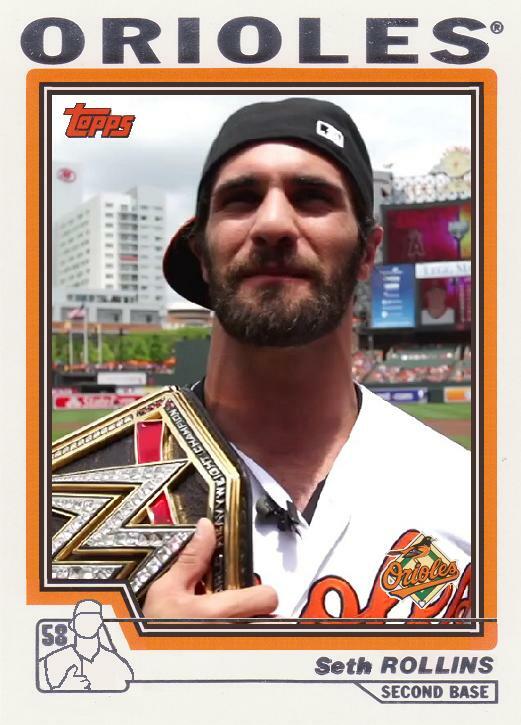 Pro wrestler Seth Rollins is a native of Iowa, but he brought his title belt to Baltimore to throw out a first pitch. It also landed him on a Celebrity Jersey Card. I love title belts on these cards. I'm going to guess he is wearing an Orioles cap (backwards).